When I was writing this 3-year recap of our home renovation, I realized I hadn't taken any photos of our master bathroom. Not that anything earth-shattering has happened in there since, but it just seemed wrong that it didn't have its own post. Particularly as it's one of my very favorite spots in the house. To refresh your memory, it didn't always look like this. It didn't even start out as a bathroom. We took this windowless room next to what became our master bedroom and turned it into a master bathroom and his & her closets. Insert renovation montage music here. So why do I love it so much in here? First off the idea of having a master bathroom that only my husband and I use is pretty fabulous. It's our private sanctuary. (Neither of us had ever lived in a house with more than one bathroom before so this is the high life!) Another perk is having my very own medicine cabinet. All my lotions and potions just for moi. And if that weren't enough, I heart the thermostatic shower. No need to futz with the hot and cold until its just right. The temp is always perfect with just a quarter turn. Another detail I'm so happy we included in the master bathroom reno was adding a between the beams skylight right over the vanity. Its a little thing but it makes a big difference. And finally, this little orchid we picked up at Ikea a few weeks ago. I have somehow managed to keep it alive thus far! No one is more amazed than me about that. Eventually, I'd like to add some art to the left-hand wall. But I haven't yet found something just right yet. Any ideas? If you liked this master bathroom renovation be sure to check out my Black and White Bathroom Mini Makeover! Your master bathroom looks gorgeous! I love the simplicity and stylish taste of it! That bathroom is amazingly wonderful. It makes me dream of the day we can re-do our downstairs bathroom. But for now I can live with the one I just redid. Its not so bad eh? 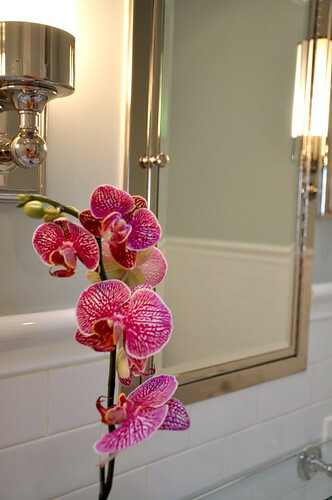 Oh and make sure you are spritzing that orchid with a squirt bottle every few days to keep it moist. Everything looks lovely. This is one of my favorite bathrooms that I have ever seen! 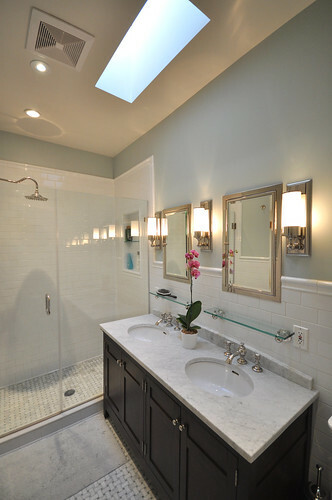 It is perfection.The added skylight above the vanity is genius!Thanks for sharing. That is one gorgeous bathroom! The orchid makes it too. I am thinking about picking up one of those. Hey, I just did some subway tile in my bathroom too, love that stuff. Yours is fabulous! Very classy and elegant! It's beyond me how you keep that tile and glass clean but it's gorgeous! For art, I would also keep that minimal - a sketch or a simple photograph but the orchid looks lovely as the centerpiece. I adore your whole home - you have done an amazing renovation. I love that you have kept the history and integrity of the building. I'm about to start the remodel on my bathroom. I have a couple of questions...where did you get the medicine cabinets and the shower faucet? Your bathroom and entire house is just beautiful - love following your blog. I only hope my master turns out a fraction as graceful and peaceful as yours - and that I can keep my orchid going too! I love it! What paint color did you use? It's beautiful and serene. Jealous!!! I love the little shelf you added right below your vanity! Great idea! The whole project came out great! Good use of space! So gorgeous and very sophisticated! I love it! I think it's great you both have your own medicine cabinet, but because it's built in to the wall, no one would ever be the wiser. The skylight is such a great idea too - there's nothing like natural light! I really like the mirrored inside of your medicine cabinet. Entire bathroom is so serene. I can see how it is one of your favorite rooms in the house. What about something along these lines for the wall? I hope the links work. Your renovation generally, and this bathroom in particular, inspire me. I'm in the very early stages of planning my whole-home reno and I love what you've done! Hmmmm. My only thought is...if you find me in there with a sleeping back, don't be alarmed...just step over me. Your bathroom is so pristine...I would think twice about adding anything. Although a simple framed piece might be nice. But please no homemade collages. An incredible amount of work with an uber excellent result!  Like everything else in your limestone, I LOVE IT! We're in the throes of finalizing a floorplan for our little fixer upper and this is exactly what I want our master bath to look like! I'm curious to know the manufacturer of your sink and shower fixtures and especially your medicine cabinets! This is one of my favorite bathrooms I've seen. I have it saved in my future house file for when I finally can live the high life too. As for art, how about some of your photos- you take such beautiful shots- you should display them! The pink accent was the first thing to catch my eye...good luck keeping it looking this beautiful! Gorgeous reno, very classic and chic. It's absolutely fabulous! I'd expect nothing less from you. Are you taking reservations? I die! You have the most amazing, taste - seriously. If this were my bathroom, I don't think that I would ever leave! It looks great! Your pictures touch upon something that I have been thinking about for our master bathroom design. I am very used to storing things vertically in my current bathroom - we have a long bathroom, and my husband and I each have a floor to ceiling cabinet to the side of our sink. We use his mainly for linens, but he has a shelf for his stuff - he only uses one drawer. I use three drawers - one for 'stuff' like toothpaste and misc, one for makeup, and one for hairdryer and hair stuff. But, I do have a shelf in my linen closet for hairspray, deodorant, hair stuff in general - and if I had to put these in a drawer, it would be a heaping mess. 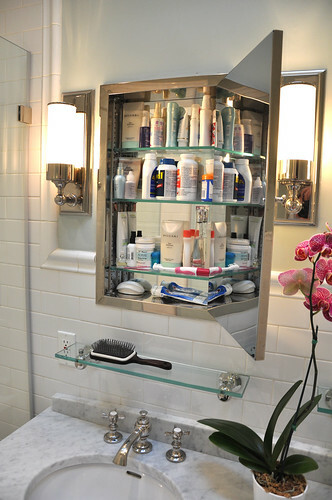 How do you like having a medicine cabinet behind the mirror for your vertical storage? My architect said this could be a solution for me, or we could put a 4" cabinet on the wall to the left of my sink. Beautiful! I really like the idea of using smaller bathroom mirrors with the shelves underneath. What about some of your black & white photography matted in white frames? I think simple would work really well in this relaxing space. Your bathroom is so lovely. I enjoy your attention to detail- the mosaic floor, beautiful shower fixture (who manufactures it?) Glass shelves above sink... well done! I love the pop of pink the flower adds to the room. I'd say simple art with maybe another pop of color on that wall. LOVE IT! Am doing my own big renovation right now and am heading in the same direction with the master bath. I had trouble finding the right inspiration picture but alas, here it is! OK, you know SOMEONE was going to ask about all the faucets, sconces, shower valves etc so...here goes, who makes what? :) Thanks for posting! ps. you and a few other bloggers inspired me to start my own blog on a whim yesterday. Many thanks for the inspiration! I love your bathroom!! Heck....I love your entire home! I'm curious where you purchased the medicine cabinets? I love the fact that they are completely recessed in the wall. It is a HUGE pet peeve of mine to see a medicine cabinet just hanging on a wall like it's a shadow box. ....or even half-way recessed...it's like the person that installed it couldn't be bothered to do the job correctly. Uugh!!! Anyway, your bathroom is to. die. for!!! Oh, it's just perfect! What a beautiful place to get ready in the mornings! Beautiful job! 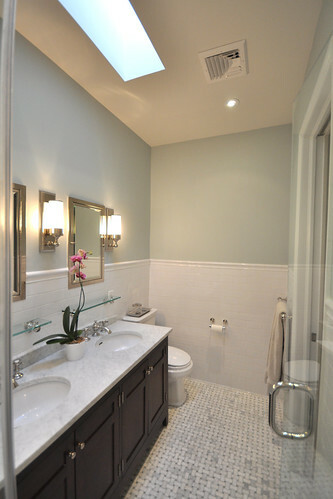 I like the way the medicine cabinets tuck into the tile AND THE SKYLIGHT -- I love the whole bathroom, really. Holy cow, the skylight just makes the entire room sparkle....that was a genius move installing it! This bathroom makes my bathroom cry and hate itself. I will try to console it with a good scrubbing tonight because I could never in a million years afford a renovation like this! I love it! It's so classic. it's beautiful, I can see why you love it! i can't wait until I have a master bath that can hide all of my clutter, but it is still so easily accessible. function is oh so important! Thanks so much everyone - glad you like it. The paint color is Benjamin Moore Quiet Moments. The shower is from Sign of the Crab (purchased onlined). Vanity, lighting, faucets, cabinets and shelves from Restoration Hardware. I love the recessed med cabinet but not all baths can have that - it depends upon what is in the wall behind the bath. Since we made a new room here we were able to recess them...but we couldn't do that in our hallway bath. Oh and I have shown my closets before. Wow!!!! I am speechless... I love your bathroom! It is definitely going into my 'idea' file for when we add a master bath. I love the wall color as well! What paint did you use? It's dreamy! I'd say you are very lucky, but I know it wasn't luck...it was tons of hard work that brought you this perfection! Enjoy! Gorgeous! Gorgeous! Gorgeous! And I think you should hang some of your own lovely black and white photography in the bath. If I had your talent, I'd display it anywhere I had free wall space. would look fab in your space. Looks like a 5 star hotel bathroom, beautiful! I've benn following you since the reno began....fun journey !!! I don't know if I ever told you this but I spent the first few days of this year reading every single post on your blog. So's your bathroom and your taste. I can't believe you've never before lived in a place with more than one bathroom! Down here in the south, a house with only one bathroom goes for less than a hundred grand. Amazing! I thought I loved your master bath. Well, that's not accurate...I'm OBSESSED with your bathroom. The temp control shower faucet? Just blew my mind! I don't even think you need art in this space. Everything is a masterpiece of itself. how big is your bathroom? it looks really similar in size to ours (long and narrowish) so this gives me hope for ours. we live and area where everyone wants the huuuuuuuge master bath and ours feels so tiny in comparison sometimes. but I wouldn't trade our charming older house for that any day! I am not usually an orchid girl... but that one is gorgeous! Love your bathroom!!!!! I love the bathroom. I loved it when you showed it to me before. You guys did a wonderful job! 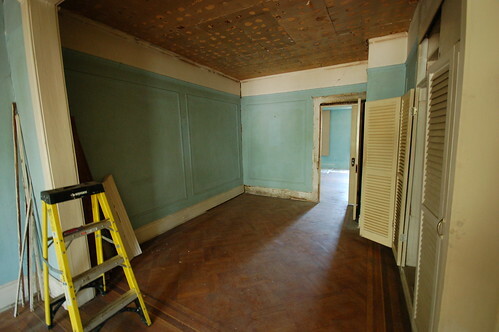 I can't help but ask--what was your budget for this reno--and did you go over by much? It's the most beautiful reno I've ever seen! Just saw your home on apartment therapy (again!). congrats! Oh girl!!! That hardware: I could just kiss it I love it so much!!! This bathroom is classic and sophisticated and absolutely gorgeous! I love the timeless look of it. I love your master bathroom! I love your bathroom simply gorgeous! it looks great! hope you're having a wonderful week my dear! oh and of course it is exquisite. i love the victorian tile - we have it in our bathroom. beautiful lighting to show off the subtle hues. a very relaxing feel which is perfect for a bathroom! 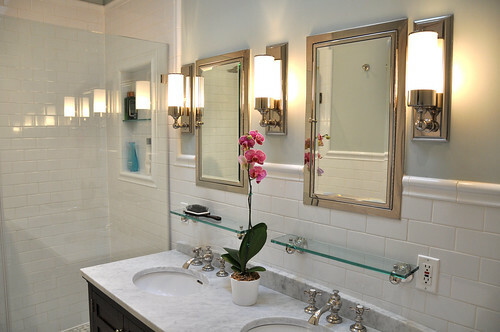 Love your bathroom - especially like the lights next to your fabulous mirrors. What an amazing and serene space! Usually I am not a medicine cabinet lover but those just might have made me change my mind. Love it! beautiful and peaceful, exactly what a bathroom should be! what was this big windowless room intended for originally? Love your color choice! The warm soft gray is beautiful with the crisp white tiles. So elegant!!! Gorgeous bathroom! I love everything about it, especially the floors. Do you mind sharing where you got them? Hi! I LOVE your bathroom! I have 2 questions for you- where did you get the shower fixture? Where did you get the medicine cabinets? Thank you for your help- I am at the beginning of a bath renno and I'm at a complete loss!! Hi - I love your site and this bathroom in particular. I am new to this, but wanted to use an espresso colored vanity in a similar bathroom (carrara floors and white subway time shower). How do you feel about the color match of espresso and carrara marble? Also, is that a carrara marble countertop? Anon - All of that information is already on this site. Just do a search on bathroom. If you have specific questions, feel free to email me. Anon- Obviously I feel pretty good about matching expresso with the marble but of course Im biased :) Yes, its a carr. marble countertop. Thank you for the answer. I think we look at the site daily as ref guide. Last question - any problems that you have noticed with staining on marble shower floor. We are being told that carrara naturally contains lead....making it very conducive to staining/rust colored fairly quickly. This is gorgeous!!!! Would you mind sharing the name of the paint color. I'm redoing a bathroom and this is the perfect blue! I love your medicine cabinets-where did you find them? I have been on the hunt for new cabinets as we are preparing to redo our bathroom. Thanks and I love your blog-great ideas!!!! Can't wait to see what 2011 brings! Thanks! Restoration Hardware is the source for most of the fixtures in here. Thanks. Color is Quiet Moments by Benjamin Moore. Not really. Sometimes there is a red line that "grows" on the edges but regular cleaning takes care of it. Your bathroom looks really great now. What a transformation! 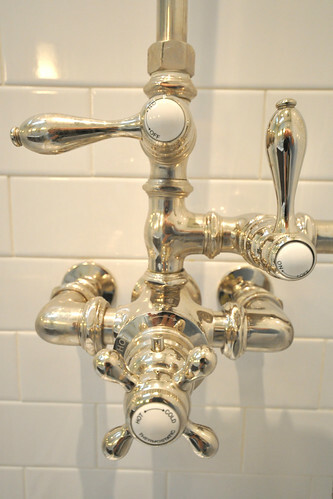 You fixtures and fittings give it a real classic look that i love! Lovely. Can you please tell me where the vanities are from? Thanks. Its from restoration hardware. Your bathroom is a huge inspriation for me! Just gorgeous!!! I love the little shelf you added right below your vanity! Your renovation generally, and this bathroom in particular, inspire me. I'm in love with your bathroom and am trying to do something similar. Am curious what you used for your shower curb? Is it another slab of marble or just long porcelain tile? Also, how did you attach the glass shelf inside your shower nook? I don't see any hardware! Also, any suggestions on pocket door hardware? Its been a few years but from memory, the shower curb was built up a bit before tiling the sides and putting a slab of marble on top. The glass shelf is attached with silicone. hope that helps.